Legal aid provides free civil legal services to low-income and elderly Oregonians and uses its limited resources to serve only the most critical legal needs—food, shelter, basic medical care, and physical safety. Legal aid services in Oregon are available in all 36 Oregon counties via legal aid offices in 17 communities. These programs are funded through a unique federal, state, and private partnership that includes over 80 sources of revenue (see below). Without help from donors like you, poor and elderly Oregonians have no meaningful access to our legal system, and “justice for all” is an empty promise. Thank you for your support! Who Does Legal Aid Help? Legal aid services focus on high priority civil legal needs: food, shelter, medical care, income maintenance, and physical safety. Nearly 850,000 low-income and elderly Oregonians qualify for the services of 100 legal aid attorneys. This year, legal aid attorneys will serve more than 20,000 clients. Legal aid stretches limited resources by providing self-help material and through pro bono programs. OregonLawHelp.org, legal aid’s educational website, received more than 230,000 visitors last year. Those eligible for legal aid must meet the federal poverty income guidelines. About 80% of legal aid’s clients are women—most of them with children to support. 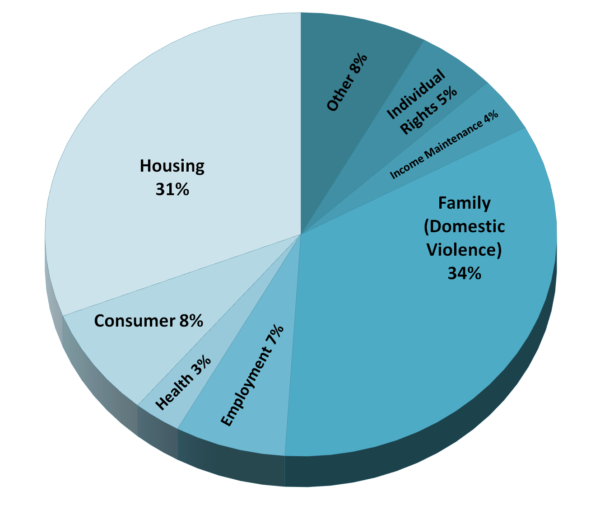 34% of legal aid’s cases are family law cases, usually helping the victims of domestic violence obtain and enforce restraining orders and create stable home environment for their children. Studies have shown that having a legal aid office in the community is the single largest factor in reducing domestic violence. Helping families maintain safe, stable housing is a critical part of legal aid’s work, as housing becomes less and less affordable and homelessness increases. Oregon legal aid programs are funded by a unique state, federal, and private partnership that is, according to Senator Ron Wyden, “a model for the nation.” In response to decreased federal support for legal aid, over 20 years ago Oregon set out to diversify and stabilize its funding sources. Today, legal aid programs receive funding from about 80 different sources. State court filing fees are currently the single largest source of funding for Oregon’s legal aid programs. A portion of state court filing fees has been directed to legal aid since 1977. 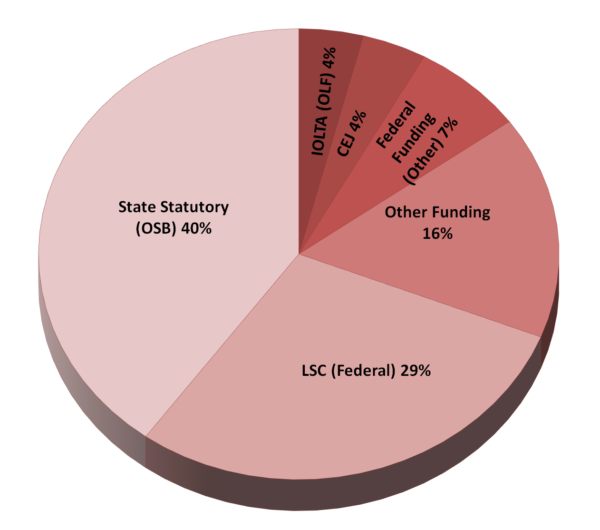 Other large sources of revenue include the federal Legal Services Corporation and the Interest on Lawyer Trust Accounts (IOLTA) funding received through the Oregon Law Foundation. Legal aid also receives funding from state, city, and county grants. About four percent of legal aid’s budget comes from CEJ donors like you—about a million dollars per year. To put that in perspective, it takes about $300,000 per year to operate a small rural legal aid office. Because of the generous contributions of the Oregon legal community, many more families across Oregon have food on the table and a clean, safe place to live.